Gov. Neil Abercrombie and Sen. David Ige sparred over several issues, with both men trying to take credit for the state's successes and blaming the other for failures, in a debate between the two Democratic gubernatorial candidates on Hawaii News Now. Gov. Neil Abercrombie offered a strenuous defense of his first term in a debate Thursday night while state Sen. David Ige insisted there has been a lack of leadership from Washington Place. Star-Advertiser. In the third debate between Gov. Neil Abercrombie and state Sen. David Ige, the Democrats again disagreed about who deserves the most credit for the state’s fiscal health and who is to blame for botching the Hawaii Health Connector. But the debate’s format, which featured the candidates sitting casually in chairs with Hawaii News Now’s Tannya Joaquin, gave the encounter the look of a talk show. The loose format also allowed the candidates to engage each other more directly. Civil Beat. The Democratic gubernatorial candidates faced off in a televised debate Thursday night. KITV4. Gov. 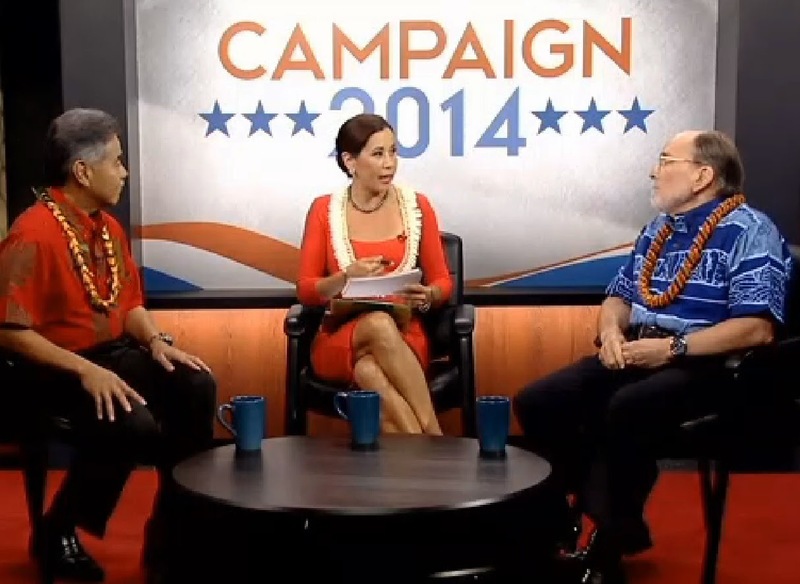 Neil Abercrombie holds a massive fundraising edge over state Sen. David Ige, his challenger in the Democratic primary. Abercrombie raised $885,600 during the past six months for his re-election campaign, according to a campaign finance report filed Thursday, and about $4.7 million overall. The governor has spent $3.9 million. Ige raised about $242,700 during the past six months. He has brought in about $389,600 in total. The state senator's campaign also received a $10,000 loan from Keith Hiraoka, his campaign manager, for campaign expenses. Star-Advertiser. Gov. Neil Abercrombie has $1 million in cash on hand as he heads into the final month of campaigning ahead of the Aug. 9 primary. Abercrombie, a Democrat, raised $885,000 between Jan. 1 and June 30 this year. Civil Beat. For U.S. Rep. Colleen Hanabusa, the Democratic primary against U.S. Sen. Brian Schatz drills down to experience. The two Democrats both entered state politics in 1998, but Hanabusa rose through the leadership ranks to become state Senate president and, while in Congress, earned the respect of the late U.S. Sen. Daniel Inouye and the retired U.S. Sen. Daniel Akaka as their choice for the Senate. Star-Advertiser. Frontrunners Differ on Gay Marriage, Obamacare in Congressional Debate In the first televised CD1 encounter, seven candidates offered their views on GMOs, Native Hawaiian sovereignty and Obamacare. Civil Beat. There are seven Democrats vying for the first congressional district seat and each is trying to distinguish themselves from the pack. KITV4. Public File: As Election Nears, Ad Buys Increase. The Aug. 9 primary is less than a month away and Hawaii candidates are purchasing ads during a greater variety of shows. Civil Beat. The Abercrombie administration has rejected a controversial $100,000 grant by the Legislature to state Rep. Rida Cabanilla's nonprofit organization. The Attorney General's office says the Ewa Historical Society isn't eligible for the grant because the IRS yanked its tax-exempt status last year. Hawaii News Now. Senator Will Espero, chair of the Committee on Public Safety, Intergovernmental, and Military Affairs, said he was disappointed about Governor Neil Abercrombie’s veto of SB2589, relating to the transfer of harbor police from the Department of Transportation to the Department of Public Safety- a bill he introduced. Hawaii Reporter. Amelia Rose Earhart, a former Denver television news reporter who was named for the famous aviator, brought her single-engine Pilatus PC-12 NG aircraft into Honolulu Airport a few minutes after noon following a four-hour, 50-minute flight from Christmas Island. Star-Advertiser. Measures designed to prohibit lying and sitting on city sidewalks as well as urinating and defecating in public continue to move through the Honolulu City Council. Star-Advertiser. A day after Honolulu city council members approved a bill that would make it illegal for people to sit or lie on public sidewalks, opponents are raising concerns the 24-hour-a-day, island-wide ban will simply move a growing homelessness problem from one area to another. Hawaii News Now. The Honolulu developers of the $300 million Park Lane Ala Moana project, a row of seven ultra-luxury, condominium towers planned for what is now a parking area at Ala Moana Center held a ground blessing on Wednesday morning and plan to start construction within a couple of months, an executive from the development team told Pacific Business News. The state should not limit itself to a smaller seating capacity when replacing 50,000-seat Aloha Stadium, several speakers told the Aloha Stadium Authority during a public meeting at the facility Thursday night. Star-Advertiser. The cast of characters and arguments are largely the same, but a pair of recent state Supreme Court decisions could color the retrial of State Department special agent Christopher Deedy. Star-Advertiser. Explaining the Deedy retrial. Recapping the murder case and explaining what will be different in this retrial versus last year's mistrial. Hawaii Independent. As a destructive pest that targets palm trees spreads farther west on Oahu, close to 170 trees at a military base on the island will have to be destroyed. The destruction left by the Coconut Rhinoceros Beetle can be plainly seen at Mamala Bay Golf Course on Hickam Air Force Base. KHON2. The City and County of Honolulu says it’ll be smooth sailing from here on out for commuters who traverse the formerly pothole-riddled Waialae Avenue in Kaimuki. Civil Beat. For at least a year and a half, Waialae Avenue has more resembled an obstacle course -- with barriers and torn-up surfaces -- than an actual public street for commuters in Kaimuki. Star-Advertiser. A groundbreaking and blessing ceremony for the Thirty Meter Telescope could be a few months away, a project spokeswoman told education and business representatives Thursday. Tribune-Herald. J Yoshimoto, as council chairman, is getting an 11.5 percent raise, bringing his annual salary to $58,008. Other council members will get 8.3 percent raises, bringing their salaries to $52,008. The raises were finalized Thursday by the county Salary Commission, which unanimously voted to increase top officials salaries retroactive to July 1. In addition to council raises, the commission also approved a $22,848 raise for Mayor Billy Kenoi, a 20.9 percent raise that brings his salary to $132,000. West Hawaii Today. The purpose of the meeting was not to discuss whether the state should make users pay to park at small boat harbors. But that contentious issue was on the minds of people attending a Thursday evening hearing by the Department of Land and Natural Resources Division of Boating and Ocean Recreation. West Hawaii Today. The CEO for the East Hawaii region of the state’s public hospital system has announced his resignation, effective Aug. 9.. Howard N. Ainsley will take on the role of CEO at Morehead Memorial Hospital in Eden, North Carolina. Tribune-Herald. More than 60 jobs with United Airlines will stay in Kona, under an agreement reached between the carrier and an employees union. West Hawaii Today. Next week, area residents will have a chance to weigh in on plans to re-power a wind farm in South Kohala. The estimated $13 million project at the Lalamilo Wind Farm would generate renewable energy to power the County of Hawaii Department of Water Supply’s (DWS) operation of eight existing water wells. Tribune-Herald. The Hawaii State Department of Health (DOH) and the County of Maui Department of Environmental Management have reached a settlement on two enforcement cases concerning solid waste violations at the Central Maui Municipal Solid Waste Landfill and the Molokai Integrated Solid Waste Management Facility. Hawaii Reporter. The state Department of Health and Maui’s Department of Environmental Management have reached a settlement on two enforcement cases concerning solid waste violations. Maui Now. As Malama Maui Nui prepare for another mass clean-up campaign on July 19, the community group said that the main source of litter by Maui roadways — unsecured vehicle loads — was thanks to drivers breaking the “uncovered truck law.” Maui Now. Compared to the six shark bite incidents confirmed on Maui during the last six months of 2013, the first six months of this year have been relatively quiet with no bites so far, though experts aren't sure why. Maui News. Kauai County Councilman Mel Rapozo says it is unlikely that he will support receiving Kauai Rising’s proposed charter amendment regulating GMOs and pesticides, meaning the measure may be headed for defeat and would not appear on the November ballot. Garden Island. Native Hawaiians on Kauai will have an opportunity to give feedback to the Office of Hawaiian Affairs at a community forum next week. The annual forum is intended for OHA officials to listen to community concerns and highlight efforts to improve conditions within Hawaiian communities. Garden Island. Ever since she was in high school, Tiana Laranio believed the best way to serve her community would be to run for political office. Garden Island.